Some have referred to Elderflower as “the catsup of flavors.” This is because of the fact that Elderflower seemingly can be used to make anything taste good. In Gins though, Elderflower has boomed since 2012. Owing to the popularity of Elderflower cordials and St. Germain Liqueur, distillers have begun imbuing their gins with the distinctive floral aroma right from the outset. 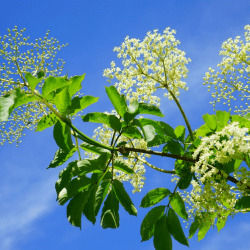 The Elderflower is the flower of the elderberry bush, and when used authentically, it must be harvested immediately in the spring upon blossoming. The flavor is slightly honey/vanilla/jasmine/pear, and completely unlike any other flavor our there. Popular in central Europe since Roman times, it’s become increasingly common in gin, cordials and tonic waters.